Video footage showing construction of the first major structure as part of the £500m M8 M73 M74 improvements project has been released by Transport Scotland. 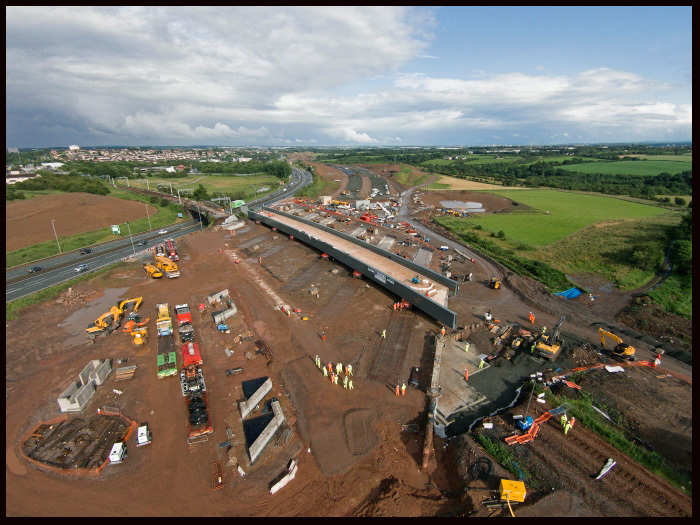 Completion of the slide is a milestone in the progress of the project and was achieved after months of meticulous and preparation between Scottish Roads Partnership (SRP), the contractor responsible for delivering the project, and its construction joint venture, Ferrovial Lagan. The three-minute footage shows onsite construction of the bridge, the possession of the railway line and the slide, and ends with the first passenger train crossing the new structure as scheduled. SRP, the consortium responsible for designing, building, financing and operating the project, took possession of the rail line on July 11 and returned it to Network Rail on July 26 with rail services resuming the following day. First phase of works involved closing the railway line over four weekends in April to allow the foundations to be laid by installing eight piles (each two metres in diameter) and reinforcing the ground on either side of the bridge. The three-span steel structure was then built adjacent to the existing railway in advance of the slide. The construction team used a self-propelled modular transporter (SPMT) system to slide the 2,000-tonne structure into place. Six SPMT platform vehicles, fitted with row upon row of rubber wheels were moved into position under the structure to carry the weight of the bridge to the ground. A computer controller was used to simultaneously drive the six SPMT platforms carrying the bridge structure 50 metres north, in an operation that lasted around four hours.